I have a pattern that I’ve existed as that my partner of almost 21 years has patiently been aware of. It’s how I run, not walk to the rescue of my youngest child, my daughter. The interesting thing is how in my running, I’m actually seeking to validate me as my mind, and in the seeking, I hide deeper within myself within my unconscious and subconscious mind. Then, I’ve used appreciation to validate and fuel the ongoing construct within a pattern that I’ve accepted direction from. 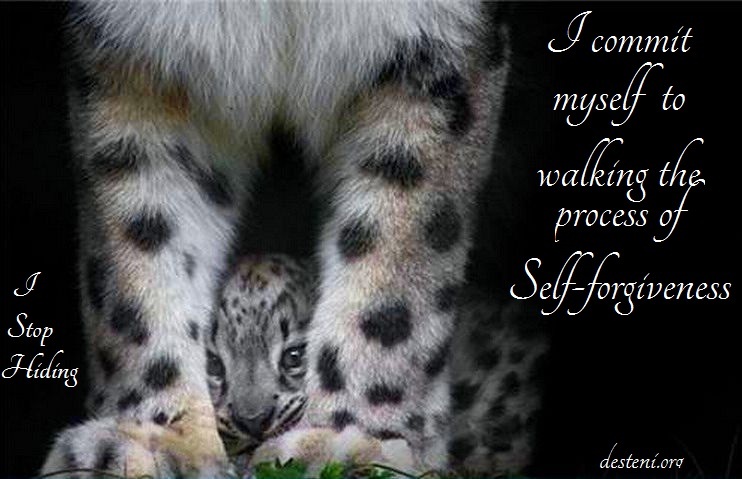 I’m here to through self-forgiveness stop the pattern and begin to re-design myself in self-honesty for/as and equal to all life. I forgive myself that I haven’t realized the fear and sadness within me because I’ve hidden and forgotten me in my self-interest fueled life of seeking. I forgive myself that I haven’t realized how I have feared being in the presence of me. I forgive myself that I’ve accepted and allowed myself to run to my daughter’s rescue at the first mention of and/or the first sign of her having the slightest problem in her life. I forgive myself that I’ve accepted and allowed myself to rescue my daughter from financial problems even when I couldn’t really afford to because I told myself that it was my responsibility, when in fact I was seeking validation for my own self-interest in validating my ego and enslaving us all further into our abusive current money system. I forgive myself that I have accepted and allowed myself to hide from taking responsibility for the atrocities that exist within this world because I’ve enjoyed the chase, the high of looking like the perfect mom by running to the aid of my daughter. I forgive myself for not being a living example of responsibility for my children and thus when my youngest child struggles with surviving in this world wherein she gets her paycheck and after rent and utility bills are paid the little money left barely buys food so she has nothing left and can’t afford to fuel her car for the following work week so when she calls and tells me I feel guilty for not pushing her more to be responsible because I’m only now grasping what self-responsibility is, so I rescue her by giving her money. I forgive myself that I’ve accepted and allowed myself to see it as my life’s call to swoop in and save my youngest daughter when her car breaks down and she can’t afford to pay for the repairs because she barely makes enough money for rent, utility bills, food and clothes for herself and her baby – instead of allowing her to face her own fears within seeing what she’s accepted and allowed so to be responsible for all that’s here in standing up in support of an Equal Money system so that all suffering ends within our world. I forgive myself that I’ve accepted and allowed myself to blame myself for the daily struggles my children face in trying to survive within a money system that values profit over life because I willingly accepted and have supported our current capitalistic money system where the rich are rich and famous because and while the poor are struggling, starving and dying. I forgive myself for accepting and allowing myself to take money for granted when my children were young wherein I spent money frivolously for household items to impress people who came to visit and as such I overextended myself and my partner where we sunk further in debt while still managing to provide an impression to my children that I could afford whatever they desired and in doing so I was teaching them to that it’s ok to live by impulses and consumerism instead of teaching them the dangers to life in how our current money system exists. I forgive myself that I haven’t allowed myself to realize that the desire, want and need to rescue my children is best defined as the religion of self and is me existing in separation from me – instead of me standing up and facing and directing me in self-honesty. I forgive myself for feeling bad toward myself for what I see is me existing in the pattern of ‘finding myself wanting’, which is a pattern I have longed feared and judged wherein self is existing in the very essence of self-interest to gratify and satisfy my own wants, needs and desires related to things of this world and further supports myself in separation of all that exist. When and as I see myself in a position of wanting and desiring to rescue my daughter/children from a situation that was preventable and isn’t life threatening – I stop. I Breathe. I realize I’ve walked this point over and over and have created situations in order to continue fueling my mind as consciousness. Instead I direct myself within common sense. I slow myself down and breathe. I begin by accepting and allowing my daughter/children the opportunity to be self-honest and self-responsible – to see and realize for themselves that life is suppose to be more than just struggling to survive. I commit myself to begin by stopping in my abusing and using my children as a way to hide from myself within my subconscious and unconscious mind as I stand and face me in self-honesty in pushing through the resistance of facing and forgiving me as my unconscious and subconscious mind. I commit myself to walking the process of self-forgiveness, breathing and taking responsibility for the creation of and as me as the mind/energy within and as this world system/money in no longer accepting and allowing that which has been created/manifested as consequences of and in separation from myself and all – instead I stand and begin here with me – to change/transform the mind system into a world that is best for all. I commit myself with patience and kindness to and toward myself as I breathe and support myself to forgive myself and begin to face who I am as my conscious, subconscious and unconscious mind so that I am able to direct myself effectively to support all living beings in bringing forth a world where all life is cherished equally. This entry was posted on April 18, 2012, in Uncategorized and tagged banking, child abuse, child support, child's play, control, Desteni, elite, Equal Money System, guilt, hide and seek, medicaid reform, money, mothers, regret, success, survival mode, welfare.